How to Find a Complete Copy of the Hillsborough County Medical Marijuana Licensing Ordinance? The Hillsborough County Commission just adopted the Ordinance needed for dispensaries to go forward. Of course the dispenary must still be licensed by the State of Florida, Department of Health, but this is a huge step forward. What are the zoning requirements under the Hillsborough County Medical Marijuana Licensing Ordinance? The Commissioners originally were to severely limit the number of licensed weed dispensaries. The final version did not include that language and opens up several parts of the county to theses providers. The complete text of the new law follows. "Hereby adopted ‘the Hillsborough County medical marijuana licensing ordinance’, as set forth herein, to be incorporated into the Hillsborough County Code of ordinances . . ."
AN ORDINANCE TITLED THE HILLSBOROUGH COUNTY MEDICAL MARIJUANA LICENSING ORDINANCE; PROVIDING FOR SHORT TITLE AND AUTHORITY; PROVIDING FOR INTENT AND PURPOSE; PROVIDING FOR FINDINGS; PROVIDING FOR DEFINITIONS; PROVIDING PROCEDURES FOR THE APPROVAL OF MEDICAL MARIJUANA DISPENSING BUSINESSES AND MEDICAL MARIJUANA DISPENSING FACILITIES; PROVIDING FOR APPROVAL OF MEDICAL MARIJUANA DELIVERY BUSINESSES; PROVIDING FOR REGULATIONS; PROVIDING FOR SEVERABILITY; PROVIDING FOR ENFORCEMENT AND PENALTIES; PROVIDING FOR APPLICABILITY AND EFFECTIVE DATE. SECTION 1. RECITALS. The above recitals are true and correct and incorporated herein as though fully set forth below. This Ordinance shall be known and may be cited as the "Medical Marijuana Licensing Ordinance." Sec. 10-504. Legislative findings and authority. (a) The recitals set forth in the whereas clauses are incorporated herein. The BOCC finds and declares that there exists a need to enact an ordinance requiring the licensing and regulation of Medical Marijuana Dispensing Facilities and Medical Marijuana Delivery Businesses. (b) This Ordinance is enacted pursuant to Section 125.66, Florida Statutes, and Section 381.986, Florida Statutes, and under the home rule powers of Hillsborough County and is in the best interest of the health, peace, safety and general welfare of the people of Hillsborough County. Sec. 10-505. - Purpose and intent. The purpose and intent of this Ordinance is to promote the health, safety and general welfare of the residents of Hillsborough County through the regulation of Medical Marijuana Dispensing Facilities and Medical Marijuana Delivery Businesses. 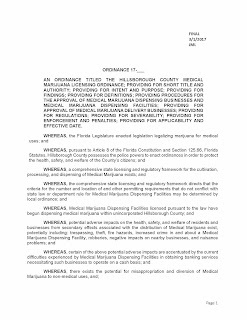 This Ordinance is intended to regulate the sale and distribution of Medical Marijuana to ensure a supply of Medical Marijuana to patients who are qualified to use and possess marijuana for medical use, pursuant to Florida law, while promoting compliance with other state laws which regulate marijuana. Nothing in this Ordinance shall prohibit an entity authorized by state law to dispense Medical Marijuana from making deliveries of Medical Marijuana to the residence or business of an authorized individual or health care facility as permitted by relevant state law, subject to the applicable requirements of this Ordinance. Nothing in this Ordinance is intended to promote or condone the sale, distribution, possession or use of marijuana in violation of any applicable state or federal law. Compliance with the requirements of this Ordinance shall not provide a defense to any criminal prosecution under any applicable law. This Ordinance is only applicable in the unincorporated area of Hillsborough County. Applicant shall mean any person or entity that has submitted an application pursuant to this Ordinance. If the Applicant is an entity and not a natural person, Applicant shall identify all persons who are the managers, officers, directors, contractual agents, partners, and licensors of such entity, as well as all members, shareholders, or Investors holding an ownership interest of 5% or more of such entity. Caregiver shall mean the legal representative authorized to purchase and receive Medical Marijuana on behalf of a qualified patient. Certificate of Approval shall mean a certificate issued pursuant to this Ordinance by the Department, officially authorizing an Applicant to operate a Medical Marijuana Dispensing Facility pursuant to this Ordinance. A Certificate of Approval generally authorizes an Applicant to establish and operate a Medical Marijuana Dispensing Facility pursuant to this Ordinance, but does not authorize the Dispensing of Medical Marijuana at any physical location within the Jurisdiction until a Premises Authorization, as defined herein, has been issued for such location. Each authorizes the issuance of a single Premises Authorization at any one time. Code Enforcement Officer shall mean any employee designated as a code enforcement officer pursuant to Section 125.69, Florida Statutes or Section 162.21, Florida Statutes. Department means the Department designated by the County Administrator to administer the mandates of this Ordinance. Derivative Products shall mean products derived from Medical Marijuana, including but not limited to, oil or consumable products containing or derived from Medical Marijuana. Dispensing shall mean the retail sales of Medical Marijuana, but does not include making deliveries of Medical Marijuana to the residence or business of an authorized individual, or to a health care facility, as permitted by state law. Employee shall mean a person authorized to act on behalf of the Medical Marijuana Dispensing Facility, whether that person is an employee or a contractor, and regardless of whether that person receives compensation. Investor shall mean any person or entity holding an ownership interest of 5% or more who is entitled to share in the profits of the Applicant, or any Lender. The term shall not include any employees who share in the profits of the Applicant pursuant to an employee profit sharing program. Lender shall mean any person or entity who has provided funds to an Applicant with the expectation of receiving from the Applicant repayment or the receipt from the Applicant of anything of value. The term Lender shall include any person who owns, directly or indirectly, 20% or more of any entity which qualifies as a Lender, but does not include any bank, credit union, or other financial institution created under federal or state law. Medical Director shall mean a physician licensed pursuant to Chapters 458 or 459, Florida Statutes, designated under Florida law and specifically identified as responsible for the supervision of the dispensing activities conducted by the Medical Marijuana Dispensing Facility. Medical Marijuana has the meaning given to it by Section 893.02(3), Florida Statutes, and shall include all forms of medical marijuana or low-THC marijuana, including Derivative Products. Medical Marijuana Delivery Approval shall mean the approval granted to a Medical Marijuana Delivery Business to authorize the delivery of Medical Marijuana within unincorporated Hillsborough County. Medical Marijuana Delivery Business shall mean any business making deliveries of Medical Marijuana to an authorized individual or to a health care facility, as permitted by state law. Medical Marijuana Dispensing Business shall mean a business entity licensed to dispense Medical Marijuana pursuant to applicable state laws and that is engaged in the retail sale of Medical Marijuana within unincorporated Hillsborough County. Medical Marijuana Dispensing Facility shall mean any establishment where Medical Marijuana is permitted to be dispensed at retail pursuant to any applicable state law and in accordance with this Ordinance. Operator shall mean the person or entity to whom a Certificate of Approval or Medical Marijuana Delivery Approval has been issued pursuant to this Ordinance. Owner shall mean any person, including any individual or other legal entity, with a direct or indirect ownership interest of five (5) percent or more in the applicant, which interest includes the possession of stock, equity in capital, or any interest in the profits of the applicant. Premises shall mean the building, within which a Medical Marijuana Dispensing Facility is permitted to be operated, including the property on which the building is located. Premises Authorization shall mean a document issued by the Department to the Operator, authorizing the Operator to conduct Medical Marijuana Dispensing Facility operations at a single, specifically approved physical location. Qualified registered patient/qualified patient shall mean a person who has been added to the state's registry of lawful recipients of Medical Marijuana by a physician licensed under Florida law, and authorized to receive Medical Marijuana, in accordance with Florida Statutes and all applicable rules. State shall mean the State of Florida. (b) In addition to the definitions contained in subsection (a), other terms used in this Ordinance shall have the meaning ascribed to them in the Compassionate Use Act and such definitions are incorporated into this Ordinance by reference. Sec. 10-507. - Certificate of Approval required. Upon the effective date of this Ordinance, no Medical Marijuana Dispensing Business, as defined in this Ordinance, may operate in Hillsborough County without first obtaining a Medical Marijuana Dispensing Facility Certificate of Approval issued by the Department. Certificates of Approval shall be granted only for Medical Marijuana Dispensing Facilities that satisfy the requirements of this Ordinance, including the payment of the applicable application fees. Sec. 10-508. - Application process and requirements. (a) It shall be unlawful for any person or entity to establish a Medical Marijuana Dispensing Business or operate a Medical Marijuana Dispensing Facility in Hillsborough County without first having obtained from the State of Florida approval to do so pursuant to the Compassionate Use Act or any other relevant law, and having obtained from the Department a Certificate of Approval, and having obtained a Premises Authorization for the Medical Marijuana Dispensing Facility to be operated in connection with such business. (b) Upon commencement of the application period as set forth in Section 10-510, each application for a Medical Marijuana Dispensing Facility Certificate of Approval shall be accompanied by a nonrefundable application fee set forth by resolution of the BOCC. (c) The Certificate of Approval and Premises Authorization shall be kept current at all times and shall be conspicuously displayed at all times in the premises to which they apply. The failure to maintain a current Certificate of Approval, or to maintain a current Premises Authorization for any location at which a Medical Marijuana Dispensing Facility is located, shall constitute a violation of this Ordinance. (d) A Certificate of Approval issued by the Department pursuant to this Ordinance shall specify the date of issuance, the period of licensure, and the name of the Operator. A Certificate of Approval issued under this Ordinance shall expire five years after the date of its issuance if not renewed in accordance with Section 10-514. Sec. 10-509. – Medical Marijuana Dispensing Facilities Established Prior to Approval of this Ordinance. (a) Upon the effective date of this Ordinance, each Medical Marijuana Dispensing Business operating in the unincorporated County shall be required to obtain a Certificate of Approval and Premises Authorization for each Medical Marijuana Dispensing Facility. However, the scoring and award process for new Certificates of Approval under Section 10-512 shall not apply to Medical Marijuana Dispensing Facilities which have been lawfully established in accordance with Florida law and applicable Code prior to the effective date of this Ordinance. (b) Medical Marijuana Dispensing Facilities which have been lawfully established prior to the effective date of this Ordinance shall be required to apply for a Certificate of Approval and renewal thereof, and issuance of a Premises Authorization. A Certificate of Approval shall be granted to a lawfully established Medical Marijuana Dispensing Facility upon the Applicant’s demonstration of compliance with the requirements of Sec. 10-511(a)(i)-(v), and Sec. 10-515. A Medical Marijuana Dispensing Facility which has been lawfully established prior to the effective date of this Ordinance shall not be limited to the application periods established in Section 10-510. (c) Medical Marijuana Dispensing Facilities which have been lawfully established prior to the effective date of this Ordinance shall also be required to comply with all operational requirements of Sec. 10-516. (d) The number of available Certificates of Approval which may be granted by the Department pursuant to Sec. 10-510 shall be reduced by the number of Medical Marijuana Dispensing Facilities lawfully established in accordance with Florida law and applicable Code prior to the effective date of this Ordinance. Sec. 10-510. - Numerical limit on Medical Marijuana Dispensing Facilities. (a) The maximum number of Certificates of Approval in the County shall not exceed 1 for every 67,222 residents, as certified in the most recent annual Estimate of Population by County and Cities published by the University of Florida Bureau of Economic and Business Research. The resulting number of Certificates of Approval available based on this calculation shall be rounded downward to the nearest whole number. 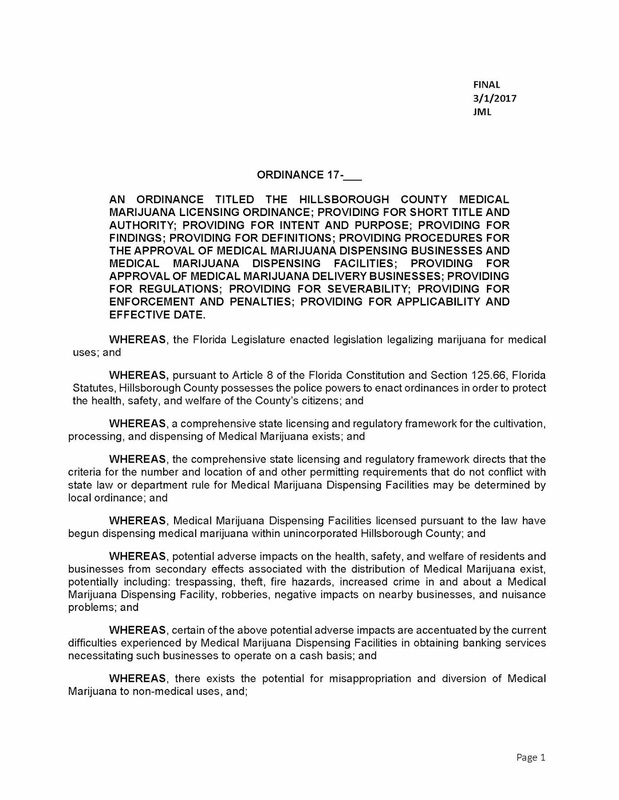 The number of Medical Marijuana Dispensing Businesses which may be granted Certificates of Approval shall be reduced by the number of Medical Marijuana Dispensing Facilities which have been lawfully established and operating in unincorporated Hillsborough County prior to the effective date of this Ordinance. Each Certificate of Approval shall authorize the holder to operate a single Medical Marijuana Dispensing Facility upon receipt of an approved Premises Authorization for the facility in accordance with this Ordinance. (b) A Medical Marijuana Dispensing Business may hold more than one Certificate of Approval, but may not hold all available Certificates of Approval issued by the County if more than one is available. The allocation of Certificates of Approval shall be in accordance with subsection (f). (c) The initial application and review period (“Initial Application Period”) for applications for Certificates of Approval shall commence within six (6) months of the effective date of this Ordinance, upon a date determined by the Department and shall close thirty (30) days following the commencement date. A subsequent thirty-day application period (“Second Application Period”) shall commence 365 days following the commencement date of the Initial Application Period. Notification of application periods shall be provided by the Department in accordance with subsection (e). Subsequent application periods shall commence at least annually each year thereafter, subject to the availability of Certificates of Approval and upon notification by the Department. (d) Five (5) Certificates of Approval shall be available for award during the Initial Application Period. The remaining number of Certificates of Approval available in accordance with subsection (a) shall be awarded during the Second Application Period. 一. In accordance with subsection (c), the Department shall provide notification of the availability of Certificates of Approval on the County website and commence of the application period, at least thirty (30) days prior to the beginning of the 30 day application period. The notice shall provide the commencement date for the receipt of applications, and the deadline for submitting applications. 一. All applications received by the Agency must be complete and received by the Department no later than the designated final day of the application period. (f) In order to ensure that the population of the unincorporated County will have access to the best qualified Medical Marijuana Dispensing Businesses, while at the same time maintaining competition in the industry, when multiple Certificates of Approval are available during an application period applicants shall be entitled to receive, upon request and qualification pursuant to this Ordinance, up to the number of Certificates of Approval set forth in the below table. Each applicant shall identify in their application the number of Certificates of Approval requested. Certificates of Approval shall be distributed to qualified applicants in ranking order according to the Table. Certificates of Approval that have not been awarded during any application period pursuant to the above table shall not become available for award until the next noticed application period. Sec. 10-511. – Application for Certificate of Approval. (a) An Applicant for a new Certificate of Approval, pursuant to the Compassionate Use Act, any other applicable state law, and the provisions of this Ordinance, shall submit an application to the Department. At the time of any such application, the Applicant shall pay an application fee, as set forth in the fee schedule adopted by the County from time to time, to defray the costs incurred for review of the application, as well as any other costs associated with the processing of the application.
. Payment of the application fee as set forth in the fee schedule established by the County. v. All documentation necessary to demonstrate compliance with the requirements identified in this Ordinance, including evidence that the Applicant continues to meet all requirements of Section 381.986(5)(b)(1), Florida Statutes. vi. All documentation the Applicant wishes to have considered for scoring purposes, including documentation demonstrating the Applicant meets the criteria detailed in Sec. 10-512 of this Ordinance. (b) Upon receipt of more than one application, Department staff shall review and score the applications pursuant to the scoring and review process established by Sec. 10-512 of this Ordinance. Sec. 10-512. –Application Period and Scoring and Review of Applications. (a) The application period shall begin when an application for a Certificate of Approval is received by the County. Upon receipt of an application, the Department shall notice on the County’s website that the application period has commenced and shall indicate the closing date of the application period, which shall be 30 days after notification is placed on the website. i. Number of retail dispensing licenses and retail dispensaries operated. ii. Total square footage of retail dispensaries operated. iii. Number of years of operating retail dispensaries.
. Number of retail dispensary employees managed.
. Gross sales of Medical Marijuana. vi. Number of different Medical Marijuana strains and Derivative Products sold. vii. Previous infractions resulting in enforcement against any Medical Marijuana dispensing license. viii. Experience with maintaining chain of custody and tracking mechanisms. i. Length of time Derivative Products intended to be dispensed have been available in regulated markets. ii. Gross sales number of units of these Derivative Products previously sold in regulated markets. iii. Gross revenue derived from previous sales of these Derivative Products in regulated markets. i. Review of standard operating procedures, operating manuals, policies, training modules, and procedures.
. Procedures for expediting ordering and / or providing for medically disadvantaged.
. Operational ERP (Enterprise Resource Planning) System. vii. Point-of-sale systems and solutions. i. Years of security experience with Medical Marijuana dispensaries in a regulated Medical Marijuana market. ii. Integration of security procedures and training into operations. iii. All owners, Investors, and managers have successfully passed a level 2 background screening pursuant to Section 435.04, Florida Statutes and have not been convicted of any felonies involving fraud, false representation, or distribution of controlled substances. xvi. Experience with dispensing medications. * Certification in Pain Medicine by the Florida Board of Medicine, American Board of Pain Medicine or other similar certification shall not be considered for purposes of Medical Director qualification. Any awards, recognitions, or certifications received for expertise in Medical Marijuana related businesses. (c) An application that is considered incomplete shall be rejected by the County. Rejected applications shall not be scored unless resubmitted within the 30 day application period and subsequently found complete. (d) The County shall disqualify any application that contains any false or misleading information. (e) The scores awarded by staff for each Applicant shall be totaled and averaged for each Applicant. Certificate of Approvals shall be issued in accordance with the table provided in Sec. 10-510(f). (f) In the event of a tie in the rankings, the Department Director shall identify the Applicant that shall be given the Certificate of Approval. Challenges to the Director’s award decision shall be filed with the County Administrator within ten (10) days of the decision being challenged. The County Administrator shall review the challenge and issue a final order dismissing such challenge or affirming such challenge. (g) If more than one application is not received, the County shall review the information included in the application to determine completeness and sufficiency pursuant to this section, and shall award the Certificate of Approval based upon a positive review of both items. Sec. 10-513. – Issuance of Certificate of Approval. (a) Upon expiration of the challenge deadlines detailed in Sec.10-512, if no challenge is filed, or upon issuance of a final order if a challenge is filed, the Department shall issue a Certificate of Approval. (b) A Certificate of Approval issued pursuant to this Ordinance does not eliminate the need for the Operator to obtain other required permits or licenses related to the operation of the Medical Marijuana Dispensing Facility including, without limitation, any development approvals or building permits required by this Code and the Land Development Code. (a) Within 90 days prior to the expiration date of the Certificate of Approval, each Operator shall pay a nonrefundable renewal fee as set forth in the fee schedule adopted by Resolution from time to time, to defray the costs incurred by the Department for review of the application and inspection of the proposed premises in accordance with this Ordinance, as well as any other costs associated with the processing of the application. The Operator is responsible for paying the renewal fee prior to expiration of the Certificate of Approval. 2. The Medical Marijuana Dispensing Facility has not been found in violation of this Ordinance or the Land Development Code. (c) Upon review of a complete application for renewal of an existing Certificate of Approval, the Department shall determine whether the renewal meets the criteria of subsection (b) of this section. If the application for renewal does not meet the requirements of subsection (b), the application for renewal shall be converted into an application for an initial Certificate of Approval pursuant to Sec. 10-511 through Sec. 10-512 of this Ordinance. (d) A Certificate of Approval shall be revoked if an Operator fails to remit a renewal fee and complete application for renewal prior to the expiration of the Certificate of Approval. Notwithstanding the expiration and revocation, an Operator whose Certificate of Approval has been revoked for not more than 30 days may be reinstated upon the payment of a late fee, as may be set forth in the fee schedule adopted by from time to time. (e) Any Premises Authorization issued under this Ordinance shall be deemed to expire on the date upon which the Certificate of Approval pursuant to which it is issued expires. Any Premises Authorization shall be deemed automatically renewed upon the renewal of the Certificate of Approval pursuant to which it is issued. (f) In the event a Certificate of Approval is not renewed, the County Administrator shall provide notification that it has become available and shall award the Certificate of Approval in accordance with this Ordinance. Sec. 10-515. - Persons or Entities prohibited as Operators. 1. Maintain approval as a dispensing organization by the State of Florida, Department of Health, Office of Compassionate Use pursuant to the Compassionate Use Act, or any other applicable law. 2. The Operator shall ensure that all owners, Investors, and managers have successfully passed a level 2 background screening pursuant to Section 435.04, Florida Statutes and shall not have been convicted of any felonies involving fraud, false representation, or distribution of controlled substances. Sec. 10-516. - Operational requirements for Medical Marijuana Dispensing Facilities. Any Medical Marijuana Dispensing Facility operating under a Certificate of Approval shall comply with the following operational standards. (a) A Medical Marijuana Dispensing Facility shall not dispense from its premises Medical Marijuana or a cannabis delivery device between the hours of 9 p.m. and 7 a.m., but may perform all other operations and deliver Medical Marijuana to qualified patients 24 hours each day. (b) No Medical Marijuana Dispensing Facility shall allow any marijuana to be smoked, ingested or otherwise consumed on the premises. (c) No Medical Marijuana Dispensing Facility shall allow the sale, service, or consumption of any type of alcoholic beverages on the premises including in the surrounding rights-ofway. (d) There shall be no outdoor displays, sales, promotions, or activities of any kind permitted on the premises on the exterior of the Medical Marijuana Dispensing Facility building, including the surrounding rights-of-way. All activities and business shall be conducted within the confines of the permanent building containing the Medical Marijuana Dispensing Facility. (e) All deliveries to the Medical Marijuana Dispensing Facility shall be made during regular operating hours while Medical Marijuana Dispensing Facility personnel are present. (iii) At the ingress and egress to any area where medical marijuana is stored. (g) The configuration of the facility shall include a waiting area that provides adequate seating without requiring waiting outside of the facility building. (h) The Medical Marijuana Dispensing Facility shall employ cash and inventory controls for all stages of operation on the premises, and during transitions and delivery. (i) The Medical Marijuana Dispensing Facility shall store all Medical Marijuana in a secured, locked room or a vault. (j) The Medical Marijuana Dispensing Facility shall require each employee or contractor to wear a photo identification badge at all times while on the premises. (k) The Medical Marijuana Dispensing Facility shall report to the Hillsborough County Sheriff’s Office and the Department within 24 hours after it is notified or becomes aware of the theft, diversion, or loss of Medical Marijuana. (l) The Medical Marijuana Dispensing Facility shall implement an alcohol and drug-free workplace policy. 一. Signage not reference the word “marijuana” or otherwise use language that openly advertises the presence of marijuana on the premises. (n) It shall be unlawful for any Medical Marijuana Dispensing Facility in unincorporated Hillsborough County to employ any person who has not successfully passed a level 2 background screening pursuant to Section 435.04, Florida Statutes. 1. The employee who dispenses Medical Marijuana or a cannabis delivery device shall enter into the Florida Department of Health Compassionate Use registry his or her name or unique employee identifier. in the compassionate use registry that a qualified ordering physician has ordered the Medical Marijuana and/or a specific type of a cannabis delivery device for the patient. 3. The employee who dispenses Medical Marijuana or a cannabis delivery device shall verify that the patient has an active registration in the Florida Department of Health Compassionate Use registry, the patient or patient’s legal representative holds a valid and active registration card, the order presented matches the order contents as recorded in the registry, and the order has not already been filled. 4. The employee who dispenses Medical Marijuana or a cannabis delivery device shall, prior to dispensing the Medical Marijuana or cannabis delivery device, confirm the identity of the authorized patient or caregiver, and obtain the signature of the authorized patient or caregiver to whom the order is dispensed. 5. The employee who dispenses Medical Marijuana or a cannabis delivery device shall, upon dispensing the Medical Marijuana, or cannabis delivery device, record in the registry the date, time, quantity, and form of Medical Marijuana and the type of cannabis delivery device dispensed. (p) Customers, clients, patients or business invitees shall not be directed, encouraged or allowed to stand, sit (including in a parked car for any period of time longer than reasonably required for a person's passenger to conduct their official business and depart), or gather or loiter outside of the building where the Medical Marijuana Dispensing Facility is operating, including in any parking areas, sidewalks, rights-of-way, or neighboring properties. Pedestrian queuing or loitering at any time, including prior to business hours, outside of the building is prohibited. 一. The batch number and harvest number from which the medical marijuana originated. (r) A Medical Marijuana Dispensing Facility shall retain records of all testing required by Florida law, and shall retain samples of each homogenous batch of Medical Marijuana, inclusive of Derivative Products, dispensed by the facility, for at least 9 months in such a sufficient amount so as to enable inspection or testing by an authorized agency under state or local law. (s) Medical Marijuana dispensed by the facility shall comply with the Florida Drug and Cosmetic Act, Section 499.001, Florida Statutes et seq. (t) The dispensing of Medical Marijuana and authorized cannabis delivery devices shall be the sole use of the premises. No other goods or services shall be provided on the premises. 4. Conform to all applicable zoning and development regulations, including but not limited to the County Land Development Code. Sec. 10-517. – Requirements for ongoing compliance and inspections. (a) A valid Certificate of Approval and Premises Authorization issued pursuant to this Ordinance shall be prominently displayed in a common public area of the facility within ten (10) days of issuance. (b) In the event any information contained in the application materials submitted for a Certificate of Approval or Premises Authorization changes, an updated application must be filed with the Department within ten days of the change. Failure to do so will result in Certificate of Approval revocation and penalty as provided for in this Ordinance. (c) Whenever ownership or management of a Medical Marijuana Dispensing Facility is changed from the ownership and management approved at the time of approval of the Certificate of Approval, written notification of such change shall be provided by the Operator to the Department at least ten (10) days prior to the change. Adequate supplemental documentation shall be provided to demonstrate that all owners, Investors, and managers have successfully passed a level 2 background screening pursuant to Section 435.04, Florida Statutes, and have not been convicted of any felonies involving fraud, false representation, or distribution of controlled substances. Ownership or management interests shall not be transferred until the requirements of this subsection have been satisfied. (d) A valid business tax receipt must be maintained by the facility. (e) Each Medical Marijuana Dispensing Facility shall be required to undergo an annual inspection by the Department for purposes of evaluating continued compliance with Sec. 10-515 and Sec. 10-516 of this Ordinance. At the time of the annual inspection, the Operator shall be required to provide a sworn or affirmed statement that identifies changes to the application materials previously submitted, if any, or that the previously submitted information remains correct, and provides confirmation that the Operator and facility remains in compliance with all requirements and standards of this Ordinance. (f) The Department may perform inspection(s) of a premises as necessary to determine whether or not the application submitted is accurate in all respects and to verify compliance with the requirements contained in Sec. 10-515 and Sec. 10-516 of this Ordinance. (g) Any code enforcement officer, law enforcement officer, or any other persons authorized to enforce County ordinances must be allowed access for inspections of the Medical Marijuana Dispensing Facility premises at any time a staff person is present, for the purposes provided in this section. Failure to allow for inspection of the premises at any time by a code enforcement officer, law enforcement officer, or any other person authorized to enforce ordinance violations at any time a staff person is present shall be a violation of this Ordinance. (a) After obtaining a Certificate of Approval, and prior to dispensing Medical Marijuana, an Operator shall select a location for its Medical Marijuana Dispensing Facility, and provide notice to the Department of the proposed facility location, identify the Certificate of Approval the proposed location will be associated with, and request issuance of Premises Authorization for such location. Such request shall be provided a minimum of 10 days prior to the dispensing of any Medical Marijuana from the location, and shall identify the location of the Medical Marijuana Dispensing Facility from which dispensing will occur. (b) Premises Authorization shall be granted for any location which complies with the requirements of this Ordinance and has demonstrated compliance with the County Land Development Code and all other applicable requirements. (c) Amendment of a Certificate of Approval and Premises Authorization solely to change the location of a Medical Marijuana Dispensing Facility shall not be denied so long as all other conditions for the issuance of a Certificate of Approval have been met and the new location complies with all premises requirements set forth in this Ordinance and all applicable Land Development Code requirements. Sec. 10-519. - Inspection of approved premises and issuance of Premises Authorization. (a) During business hours and other times of apparent activity, all approved premises shall be subject to inspection by the Administrator of this Ordinance, the Fire Chief, the Building Official, County Sheriff, or the authorized representative of any of them, for the purpose of investigating and determining compliance with Sec. 10-515 and Sec. 10-516 of this Ordinance and the applicable fire and building codes. Where any part of the premises requiring inspection for purposes of this subsection consists of a locked area, such area shall be made available for inspection, without delay, upon reasonable request. (b) Medical Marijuana may not be dispensed pursuant to a Certificate of Approval until the proposed premises have been inspected to determine compliance of the premises pursuant to subsection (a), and has issued Premises Authorization. (c) The Department shall, within 10 days of receipt of a request for Premises Authorization, and after inspection of the premises to be utilized in accordance with this section, notify the Certificate holder that it may begin dispensing Medical Marijuana at that premises and issue a Premises Authorization to the Certificate holder, or provide to the Operator written notice detailing the reasons the selected location does not comply with this Ordinance. A Premises Authorization issued pursuant to this Ordinance shall specify the Certificate of Approval pursuant to which it is issued, all information set forth on the Certificate of Approval, and the physical location of the premises approved, once such approval is received. Sec. 10-520. –Medical Marijuana Delivery by Medical Marijuana Delivery Businesses. Compassionate Use Act or any other relevant law, and a Medical Marijuana Delivery Approval issued by the Department in accordance with the following requirements. (a) Each application for a Medical Marijuana Delivery Approval shall be accompanied by a nonrefundable application fee in the amount of $50. The application fee is in addition to the $50 renewal fee due upon renewal of the Medical Marijuana Delivery Approval every five (5) years. Any changes to the application fees authorized by this Ordinance may be accomplished by resolution of the BOCC without the need to amend this Ordinance. (b) A Medical Marijuana Delivery Approval issued by the Department pursuant to this Ordinance shall specify the date of issuance, the period of licensure, and the name of the Medical Marijuana Delivery Business. A Medical Marijuana Delivery Approval issued under this Ordinance shall expire five (5) years after the date of its issuance. (c) Renewal of an existing Medical Marijuana Delivery Approval shall be automatic for successive five year periods upon payment of required fees to the Department. (d) Within the 30 days prior to the expiration date of an existing Medical Marijuana Delivery Approval, each Operator shall pay a nonrefundable renewal fee as set forth in the fee schedule adopted from time to time, to defray the costs incurred by the Department for review of the application, as well as any other costs associated with the processing of the application. The Operator is responsible for paying the renewal fee prior to expiration of the Medical Marijuana Delivery Approval. (e) A Medical Marijuana Delivery Approval shall be revoked if an Operator fails to remit a renewal fee prior to the expiration of the Certificate of Approval. Notwithstanding the expiration and revocation, an Operator whose Medical Marijuana Delivery Approval has been revoked for not more than 30 days may be reinstated upon the payment of a late fee, as set forth in the fee schedule adopted from time to time. 一 Identifying information, including license plate numbers and vehicle identification numbers, for each vehicle which will be engaged in the vehicle delivery of Medical Marijuana within the unincorporated county. 一 Evidence that each employee or agent who will be engaged in the vehicle delivery of Medical Marijuana within the unincorporated county has successfully passed a level 2 background screening pursuant to Section 435.04, Florida Statutes. Business operates in unincorporated Hillsborough County utilizing personnel who have not met the requirements of subparagraph (f)(4) or utilizes a vehicle for which information has not been submitted as required by subparagraph (f)(2). Sec. 10-521. - Grounds for Certificate of Approval or Medical Marijuana Delivery Approval revocation. (b) For revocation of a Certificate of Approval, the Applicant or Operator, or his or her agent, manager, or employee, have violated, do not meet, or have failed to comply with any of the terms, requirements, or provisions of this Ordinance or with any applicable state law or regulation, and only if such failure materially impacts the accessibility, availability, or safety of the Medical Marijuana, or impacts the safety of persons at the Medical Marijuana Dispensing Facility. 一. The Department shall provide notice of any of the above deficiencies accompanied by a 30 calendar day period in which to cure such deficiencies. 一. Within 30 days of receipt of a notice of deficiencies, the Operator shall submit to the Department a plan to correct such deficiencies. 一. The Operator must execute the plan within 30 days of the date the plan was submitted to the Department. 一. If a plan is not timely submitted, or the plan is not timely executed, the Department may proceed to revoke the Certificate of Approval. 一. Notwithstanding the foregoing, upon a finding by the Department for good cause shown that the continued operation of the Medical Marijuana Dispensing Facility presents an imminent and immediate grave threat to the public health or safety, the Department may issue an emergency order directing the Operator to temporarily cease sales at that location pending resolution of the deficiency. (c) If dispensing fails to occur within 18 months of a Certificate of Approval being issued, the Certificate shall be revoked and shall be available for issuance to a new Applicant subject to the procedure for Certificate of Approval award provided in this Ordinance. (d) For revocation of a Medical Marijuana Delivery Approval, the Applicant or Operator, or his or her agent, manager, or employee, have violated, do not meet, or have failed to comply with any of the terms, requirements, or provisions of this Ordinance or with any applicable state law or regulation, and only if such failure materially impacts the accessibility, availability, or safety of the transport and delivery of Medical Marijuana within the unincorporated county. 1. The Department shall provide notice of any of the above deficiencies accompanied by a 30 calendar day period in which to cure such deficiencies. 2. Within 30 days of receipt of a notice of deficiencies, the Operator shall submit to the Department a plan to correct such deficiencies. 3. The Operator must execute the plan within 30 days of the date the plan was submitted to the Department. 4. If a plan is not timely submitted, or the plan is not timely executed, the Department may proceed to revoke the Medical Marijuana Delivery Approval. 5. Notwithstanding the foregoing, upon a finding by the Department for good cause shown that the continued operation of the Medical Marijuana Delivery Business presents an imminent and immediate grave threat to the public health or safety, the Department may issue an emergency order directing the Operator to temporarily cease delivery within the unincorporated county pending resolution of the deficiency. Sec. 10-522. – Review of Certificate of Approval or Medical Marijuana Delivery Approval denial or revocation. (a) The Department shall provide written notice, with proof of delivery, of the denial of any new or renewal Certificate of Approval or Medical Marijuana Delivery Approval, or revocation of an existing approval, specifying in writing the grounds for the denial or revocation. (b) The applicant for Certificate of Approval or Medical Marijuana Delivery Approval whose application has been denied (except for an incomplete application) may request a formal review of the denial before the Department's assigned hearing officer if the applicant asserts that the denial was erroneous. 一 The applicant must submit a written request for review indicating the specific alleged error or errors made by the Department along with any and all facts and documents that support the applicant's position that the decision to deny the application was in error. The request must be received by the Department within ten (10) business days of the delivery date of the denial notice. 一 The review shall be performed by an independent hearing officer appointed by the County to perform license reviews and hearings. The hearing officer shall review the applicant's request and all supporting documents to determine if by the preponderance of the evidence, sufficient cause exists to grant a hearing on the request. In the event the applicant's request and supporting documents do not state a prima facie case that error has occurred, the hearing officer may summarily dismiss the request and notify the applicant in writing of the dismissal. Whenever, in the opinion of the hearing officer, an applicant's request and supporting documentation establishes a prima facie case of error, a hearing will be set and conducted for the hearing officer to rule upon the matter. The standard of review shall be whether, based on clear and convincing evidence, the facts support the denial. (c) The holder of a Certificate of Approval, or Medical Marijuana Delivery Approval, whose approval has been revoked may request a hearing before the assigned hearing officer. 1. The applicant must submit a written request for hearing, which must be received by the Department within ten (10) business days of the delivery date of the revocation notice. 2. A hearing will be set and conducted by an independent hearing officer appointed by the County to perform reviews and hearings. The standard of review shall be whether, based on clear and convincing evidence, the facts support the revocation. (d) The County Administrator shall adopt a policy establishing review and hearing procedures. Reviews and hearings will be conducted in accordance with that policy. In addition to other powers of the hearing officer as set forth under the County Administrator's policy, the hearing officer shall have the power to issue subpoenas for the production of documents and attendance of witnesses at a hearing, upon the written request of either the Department or applicant or approval holder. The decision of the hearing officer shall be final. It shall be unlawful for any person to violate any provision of this Ordinance or to operate a Medical Marijuana Dispensing Facility without a valid County-issued Medical Marijuana Dispensing Facility Certificate of Approval and Premises Authorization. Sec. 10-524. - Service of notice; public records. (a) Any notice required by this Ordinance shall be in writing and sent by certified mail or hand delivery to the mailing address set forth on the application for the Medical Marijuana Dispensing Facility Certificate of Approval, except that notices for Code violations shall be provided in the manner prescribed in Chapter 14 of this Code. The mailing address included in the application shall be considered the correct mailing address. It shall be the obligation of the holder of the Medical Marijuana Dispensing Facility Certificate of Approval to provide the Department with notification of its updated address for notice purposes. (b) Any information contained in any application or submission under this Ordinance is subject to the public records law, Chapter 119, Florida Statutes, unless specifically exempted by law. Sec. 10-525. - Enforcement and penalties. The County's code enforcement officers, law enforcement or any other person authorized to enforce County ordinances may enforce the provisions of this Ordinance. 2. In addition to or in lieu of any other remedy, any person who violates this section may be subject to administrative actions as authorized in Chapter 162, Florida Statutes, (Parts I and/or II) and outlined in Hillsborough County Code of Ordinances and Laws, Part A, Chapter 14, as amended. 3. A Hearing Master may be appointed and shall have jurisdiction to conduct hearings and decide if a person has failed to comply with any of the relevant provisions in this Ordinance. A Hearing Master shall have all of the powers granted to them by Resolution of the BOCC. initiating an action to recover any and all damages that may result from a violation of, or refusal to comply with, any part of this Ordinance. 3 Utilizing any other action or enforcement method allowable by law. Sec. 10-526. - No County liability; indemnification; no defense. (a) By accepting a Certificate of Approval and Premises Authorization issued pursuant to this Ordinance, the Operator waives any claim concerning, and releases the County, its officers, elected officials, employees, attorneys and agents from, any liability for injuries or damages of any kind that result from any arrest or prosecution of business owners, Operators, employees, clients, or customers of the Operator for a violation of state or federal laws, rules, or regulations. (b) By accepting a Certificate of Approval and Premises Authorization issued pursuant to this Ordinance, all Operators, jointly and severally if more than one, agree to indemnify, defend, and hold harmless the County, its officers, elected officials, employees, attorneys, agents, insurers and self-insurance pool against all liability, claims, and demands on account of any injury, loss, or damage, including without limitation claims arising from bodily injury, personal injury, sickness, disease, death, property loss or damage, or any other loss of any kind whatsoever arising out of or in any manner connected with the operation of the Medical Marijuana Dispensing Facility that is the subject of the Certificate of Approval and Premises Authorization. (c) The issuance of a Certificate of Approval and Premises Authorization pursuant to this Ordinance shall not be deemed to create an exception, defense, or immunity for any person in regard to any potential criminal liability the person may have under state or federal law for the cultivation, possession, sale, distribution, or use of Medical Marijuana. If any section, subsection, sentence, clause, phrase or provision of this Ordinance is for any reason held invalid or unconstitutional by any court of competent jurisdiction, such holding shall not be construed to render the remaining provisions of this Ordinance invalid or unconstitutional. WITNESS my hand and official seal this ______ day of _______________, 2017.